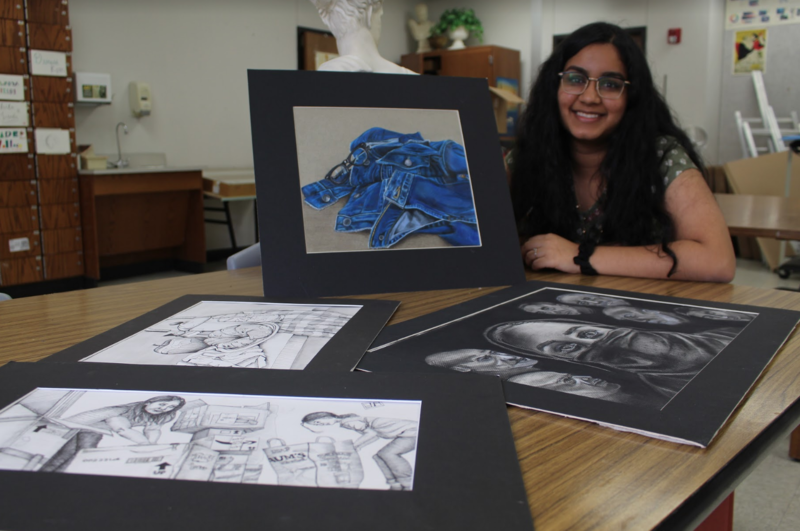 Coppell High School junior Vaishu Nalla holds poses with her favorite artwork, titled “Billie Jean.” Nalla made this in her sophomore year using colored pencil and received a silver medal after entering it in VASE. Art impacts the lives of students at Coppell High School in many ways. 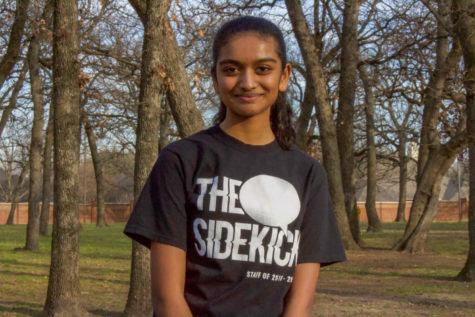 For Coppell High School junior Vaishu Nalla, art serves as an outlet to convey her inner self. Vaishu comes from a long line of artists. Her grandfather, V.V.B.Chary was a sculptor and her mother, Savitha Nalla, is a painter. Throughout her life, Vaishu has explored different media including watercolor, oil painting and batiks. However, she finds that she excels in realism: attempting to represent the subject of the artwork truthfully. Nalla implemented realism in her portfolio that she created last year in AP Drawing, which included her favorite piece, “Billie Jean”. For Nalla, creating these portfolios has allowed her to grow not only as an artist but also as a person. Last year, her theme was about the oppression of women in different countries. A few pieces included a drawing of foot binding as well as a picture depicting the wage gap. This year Nalla is in AP Art 2D Design and is in the process of choosing a new theme for her next portfolio. She looks forward to learning more about art and figuring out who she is as an artist.